Henry William Huckle was born in 1886, the second son of Henry and Emma Huckle of Hitchin. He was educated at Hitchin Grammar School before matriculating at Downing College in 1907, studying for the Ordinary BA and specialising in Modern Languages. 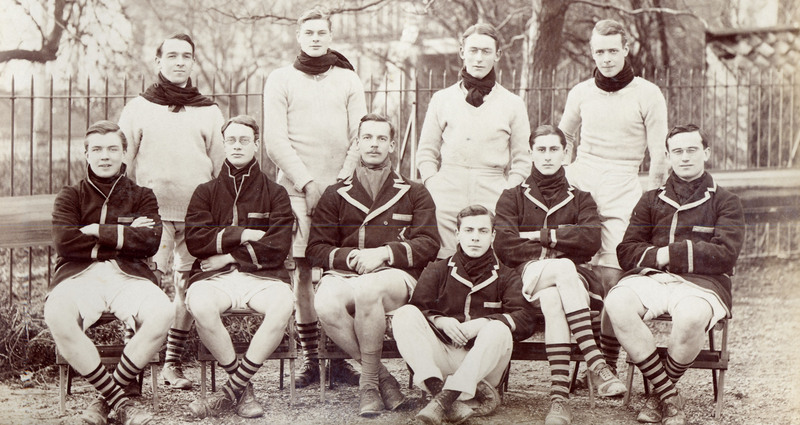 While at the College, Henry was an active member of the Boat Club, rowing in the 1909 Lent Boat and 2nd Boat the following year. Archive photographs survive of him in the Boat Club Trials in 1907 and 1908 and as a member of the 2nd Lent Boat, 1910 (seen here, standing back left). Henry did not graduate until January 1912, taking ‘Specials’, in English and French, in the Michaelmas 1910 and 1911. In April 1911 he was working as a teacher at the Commercial School in Cardiff and was later appointed Chief Clerk to the Oxford and Cambridge Schools Examination Board. He married Mary Porter in September 1914 and they lived in Trumpington with their two daughters. Henry enlisted as a Private with the Artists’ Rifles (28th (County of London) Battalion, London Regiment) in March 1917 and received his commission as 2nd Lieutenant in the Cambridgeshire Regiment on 26 Feb 1918. 2nd Lt. Huckle was killed in action on 5 September 1918, only 16 days after arriving in France. He was a platoon commander in B Company and was killed during the failed attack on the village of Nerlu. He was 32 years old. He is buried in the Peronne Communal Cemetery Extension. Download an information sheet on Henry William Huckle.